With code, things either work or they don’t, but life itself is not binary, or black and white. It is full of colour, it is grey, and it lives on the margins of both, ambiguously. Life’s force is enigmatic and irrepressible. Live it, and you will know at a very visceral level how it can be both strong and fragile, and often at the same time. We know throughout history human will power, that ‘mind over matter’ thing, and the force of the human spirit has shown it can achieve the incredible. In the virtual world, this dimension of human character has an even bigger part to play. I think we must call it forth in response to code. We also know that group and ‘hivemind’ thinking can shape much of our decision-making. The experiments and A/B tests being played out all over the web today are revealing how. So this is the paradox of the networked age: Code’s binary nature is balanced by a connected, digital, ‘one planet’ world of great complexity. If digital code is binary, emergent code is the calling forth of human consciousness as a response to it. It’s a level-up, a step change in human evolution, in response to the risk of becoming reduced to automatons, part of a world-wide, coded and orchestrated deployment. Emergent code is the thought that opposites blend, it appreciates nuance, and is a counterpoint to black and white, ‘us and them’, binary thinking. And this acceptance of paradox as part of the digital world is the equivalent perhaps of the paradigm-shifting arrival of perspective that took place in the Renaissance. As digital technology shapes wraps itself around us, we can become enlightened by it just as we were by scientific advancement back then, by going beyond binary thinking to developing a new way of being. In this process, the easy convenience of stereotyping is cast aside. We look at each other as unique and individual identifiers, just as everything else online is now like that. So to me, our development as an entire human species depends on how well we embrace this as digital humans so that we can be an equal and opposite to code, and our humanity is safeguarded by operating in synthesis with code by focusing on the things its robotic algorithms cannot do. As work and interactivity become increasingly automated, we have the chance to focus on other things, our consciousness, on our identities and sense of self, and on reconciling the shadows sides of human character, to ensure our survival. The networked, complex world is nuanced and it is one where opposites co-exist. Accepting the duality of life, there is the acknowledgement of both hard and soft, light and shade, and fast and slow to it; life itself cannot change in this fact if it is real and not merely manufactured. If that sounds idealistic, there is a brutal logic behind this idea, because it perhaps is the only way we can create a workable, viable connected digital world for the future, and a world in which we are all vibrantly inter-dependent. Code delivers efficiency, automation, ease and convenience, but it is compassion and the creative nature of humanity that sustains, provides meaningful truth and gives a purpose to our existence. In this binary-driven digital era, with the transformational value of technology, the enlightenment of code is that it can enable us to be more human. The greatest artists of the Renaissance, Giotto, Masaccio, Fra Angelico and Botticelli made cultural, artistic and intellectual leaps for humanity through their expressions of emotion. Their paintings of the human spirit put us in touch with a new vision of what life could be. 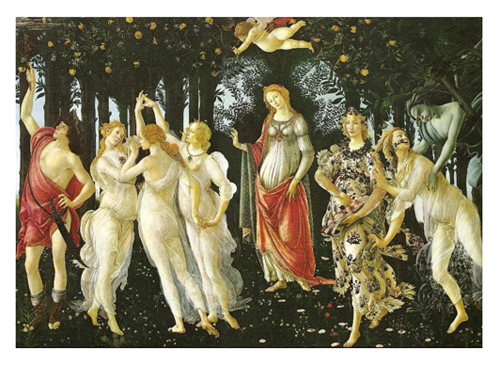 This is Sandro Botticelli’s depiction of Spring called ‘Primavera’. 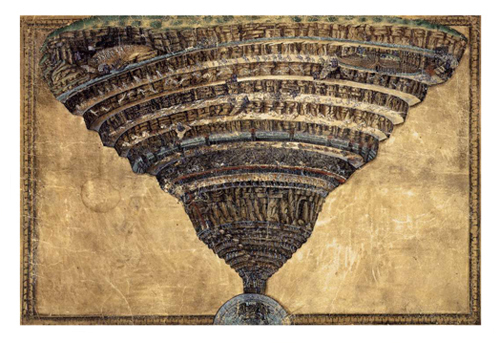 And this is his image of the abyss of hell. At its very best, the Digital Era can create similar leaps of imagination and possibility for the human condition. Every day, social media provides us with a collective depiction of the human spirit operating at huge scale, but its insights are more often than not hidden behind closed doors. 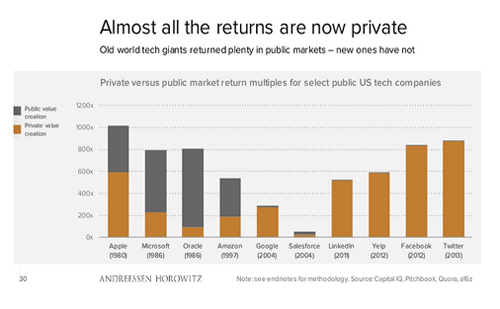 This chart from the digital investment firm Andressen Horowitz (‘a16z’ as it’s known) shows how data has slowly become less public over the years since the World Wide Web’s inception. If organic human expression is cultivated well digitally, technology can give us a powerful sense of our true human pulse as a connected species. But if we struggle with our identity as digital humans and how we come to terms with it in this ambiguous, complicated, connected world, then black and levels, the binary categories we give each other, will be unlikely to help us.